Travels in Turkey- Ancient Rhythms, Things Don't Really Change. In Turkey, as in everywhere in the middle east, although the cities are very busy and packed with people, most people live in the villages. In the cities and in every village there are streets with seemingly endless shops selling everything you can think of. There are also open air markets and bazaars selling fresh vegetables, fruits, meat, nuts, and variety of goods and services. You can have your car fixed, get a haircut, have a suit made and buy your dinner all within about 50 yards. You never see shopping centers. It is a neighborhood type of thing. In the villages and even in the cities, everyone knows everyone in their neighborhood and all their personal business. You can't make a move without someone telling someone else they saw you and what you were doing. This creates a kind of controlled environment, a system that allows you very little freedom. In the eastern parts of Turkey there were arranged marriages. During your childhood your family would have committed you to marry a certain boy or girl. That was it. No choices. If you didn't like your husband or wife, forget it. There is no divorce. If you left your spouse or got a divorce your family would disown you. This kind of structure was in place all over the Middle East for hundreds of years, maybe even thousands. The same goes for many other areas of Africa and Asia. You were born, you grew up, raised a family, went to church, mosque or temple. You never left. You raised your children, your children stayed close, and when you got old and feeble they took care of you. That was life back then. People rarely left their villages, even to visit a neighboring village. Your world was very, very small. Look at the western world now. Can you imagine living like this in the U.S or Europe? It's basically inconceivable. It's because we have choices. We have freedom. What have we traded for our "freedom"? What bargain have we struck to have a big beautiful home, expensive cars and all the things we think are important? Why have we chosen a life that requires both parents of a family to work 8-10 hours a day just to make their payments? Yes, many people make more than enough to pay the bills, even save for the future or fund a child's education, but at what cost? We spend our lives working for money to pay for the houses we only spend a few hours a day in, spending limited time with our spouse or kids, sleeping for 6-8 hours, only to get up and do it again. Yes, we have freedom but is it real? Or is it an illusion. An illusion that we have free choice? Yes, you can take extra vacations, if you're allowed. Yes, you can work less and spend more time with your family but what happens if your income goes down and you can't make your payments? Yes, you can travel the world but only if you wait until you're 65 and retired. Yes, you could quit your job and try to follow your passion by starting a business but your spouse would probably freak out. So in some ways we are very similar to the villagers living in Turkey and the Middle East. The major difference is that we know what's out there. We know there's a whole world out there, we've seen it, and we can go there. We have been there. Living in a closed world where you don't have choices or even the knowledge of anything else? Where there is no future-thinking, no dreaming. Where your world is very, very defined .... and accepted. And therefore easier and simpler, no dreams=no stress. Or is it worse living in a world obsessed with more, bigger, better, newer? A world based on the promise of a future, the hope of "someday", the coming day of your freedom? They say ignorance is bliss and it really is. But we can't go back. We can only find ways to change our circumstances, to modify or remodel our lives. And slowly, bit by bit, we can change things. We can step back from the seeking and the needing. We can simplify our lives, reduce our requirements, reduce our needs and reduce the amount of time we trade for money. 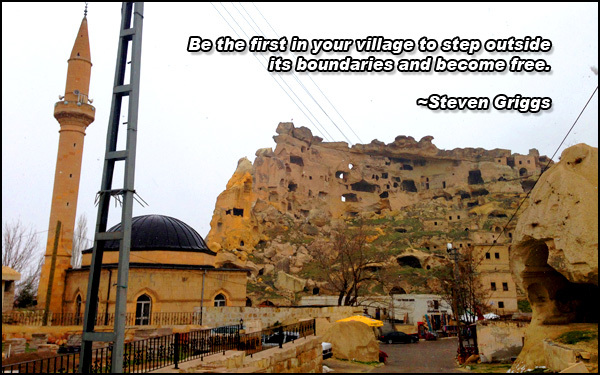 Be the first in your village to step outside its boundaries and become free.